Mighty Munchkins 2.0 is a full day program combining exciting weekly theme based preschool activities along with off campus field trips to the Can Do Playground and local attractions. With a low camper to staff ratio, our preschoolers get plenty of attention as they run through sprinklers on our wet and wild water days on campus or experiment with the different kid friendly features offered at the Can Do Playground. Teachers take a thematic approach to activities each week as campers dabble in arts and crafts, gym, music/movement, and storytelling. Favorite themes from last summer include Diggin’ Dinos and Slitherin’ Snakes. Each Friday is celebrated with a culminating activity to bring in the weekend. See schedule for details. *Note: While Potty training is not required, we expect that parents will have begun this process with their child before attending camp. Throughout the summer, our staff will work with campers as necessary by developing a routine in order to help them become more independent in this process. 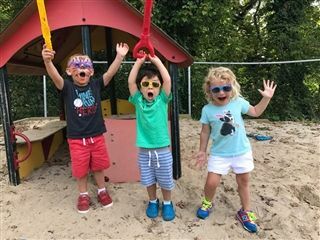 Location: The Lower School Day Camp is located at the Lower School campus of Wilmington Friends School, just off Granite Road in Alapocas. On-site facilities include a large multipurpose gym, two art/computer/activity rooms, a kitchen, locker rooms, and outdoor fields and play equipment. Clothing and Toys: Children should wear cool, comfortable, weather appropriate clothes to camp, and be prepared for both outdoor and indoor activities. All campers must wear sneakers and socks. Please do not send your child to camp in sandals. Campers will not need to bring toys to camp. While it is appropriate for our Mighty Munchkin campers to bring a favorite blanket or stuffed animal to help them relax during quiet time, all other toys and electronic devices are prohibited from being brought to camp. Absences: If your child is going to be absent, please call (302) 576-2998 after 7:30 a.m. to inform the camp staff.